You and I are much too sophisticated to believe that the One Jesus calls Father is necessarily anything like ours. Of course God isn’t like the father who left us, or the one who suffered with mental illness, or the one who drank too much, or died too early. Who would even think that? We’re certainly too savvy to believe that something about us caused our fathers to leave us. That’s like voodoo rain-god crazy. Then, when we least expect it—kapow! We discover that that’s exactly what we’ve believed, in our bones, all along. In our deepest places we have suspected both that God could not be trusted and that we have been unworthy of love, human or divine. Though our heads and hearts have tried to seal up the rupture, it’s too late. It’s already out there. 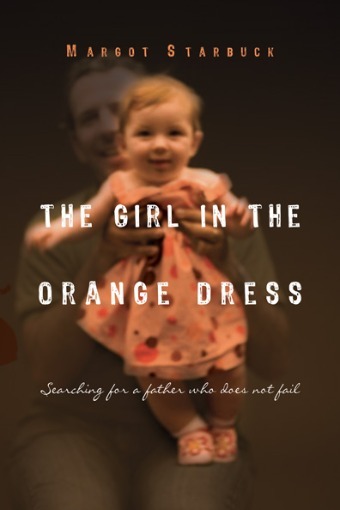 ​The Girl in the Orange Dress describes the journey of one woman who held it together through a rocky childhood and, after finding her birthparents as a young adult, began to come unglued. Graciously, as she is gently loved back together through human agents, she comes to know a Father who does not fail. "Margot Starbuck takes us on a lovely and challenging journey, searching for herself, her family, and her faith along the way." "Simply put, this is a brilliant book. Beautifully written, it’s a must-read for all of us who realize our deepest longing is for a true experience of our real Father. Don’t miss this book!" The Golden Scroll winners were announced at the Advanced Writers and Speakers Association (AWSA) annual banquet held on Sunday, July 10, at the Omni Hotel at CNN Center in Atlanta. The AWSA, which consists of more than 300 top female communicators who both publish and speak nationally, called the book "a cleverly written, poignant memoir regarding the author's search for a true 'father who does not fail.'" InterVarsity Press joins the AWSA in celebrating Starbuck's unique voice and the important message she shares through her work. "Margot is a wonderful storyteller and narrates with a delightful self-effacing comic voice," Cindy Bunch, associate editorial director and the book's editor, said. "But what makes this memoir stand out among others is her pastoral heart for readers who are also searching for a father who will not fail. For these readers she points the way to the very heart of God."